Welcome to Amphibian Air An Amazing Flying Adventure. We are based in Savannah Georgia, during the winter we also have several operating locations throughout Florida. 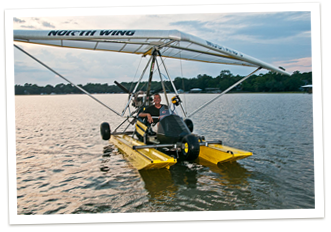 Take an introductory flight in a FAA certified amphibious trike, ( Ultralight/Weight Shift Control/Light Sport Aircraft ), help writing personal statement with a FAA certified flight instructor. Our open cockpit, powered hang glider is like riding a motorcycle in the sky. We will fly “low and slow” and you’ll experience what it must feel like to be a bird soaring over the landscape. During your flight you will learn the basics of trike flying. If you want want to, and conditions permit, you can take control and see how easy it is to fly this amazing aircraft, you’ll even get a certificate recording your training which can be used towards a Sport Pilot License. We cater to thrill seekers and scaredy cats alike! Try this “bucket list” fulfilling adventure; you’ll leave with some real “hands-on” piloting time and memories you’ll never forget! See what our customers have to say on our Guest page and FaceBook page and on TripAdvisor. Friend Us, Follow Us, Share! Copyright © Amphibian Air - All Rights Reserved - Web Hosting, Design and Marketing by InMotion Hosting, Inc.